This entry was posted in Quilting, Sewing Projects on September 5, 2014 by Jo. Last week my niece, sister and her kiddos came for a visit. When we all get together it is a massive show and tell. Our day got cut short by a sick kid so I didn’t get pictures of a two projects my sister was working on but I did get pictures of Jody’s project. 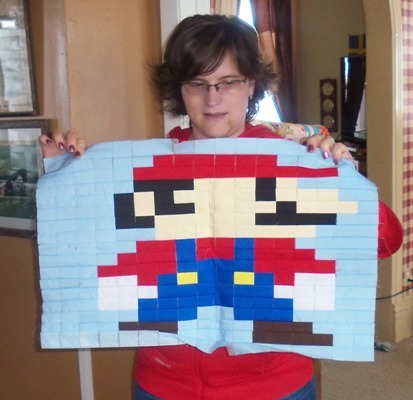 If you have a Mario Brothers fan at your house you are going to love this. 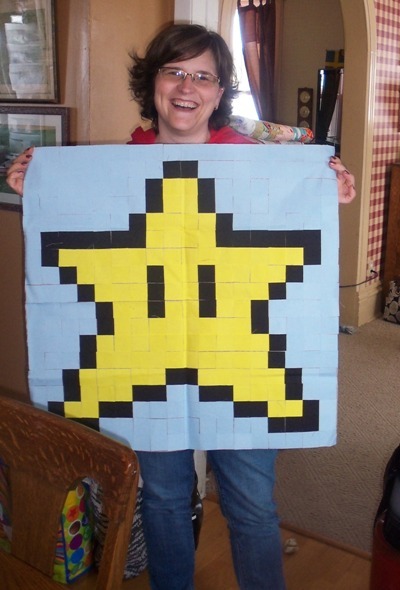 Jody explained that she found a blog that had a quilt along that was making quilts with the characters from Super Mario (it’s a video game for those who don’t know). She explained that she cut squares. She put them onto a product called Stitch and Wash Away. Then she folds along the line and sews first vertically-then horizontally. Here are her blocks in progress. Here the one she is holding now has been sewn on the horizontal lines making the character look flat but she will sew the vertical lines and he’ll be proportionate again. 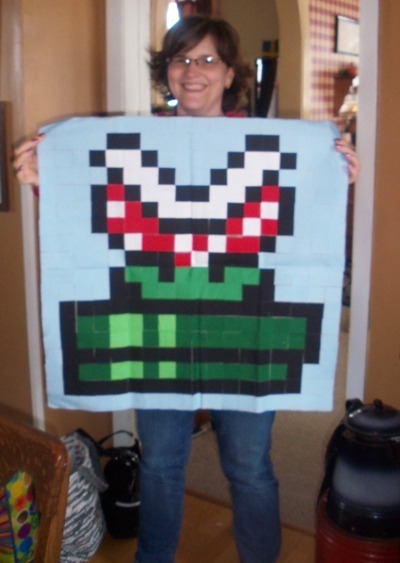 If you are looking for more information on making this quilt you can find it at Cut to Pieces. The pattern to make this is for free. 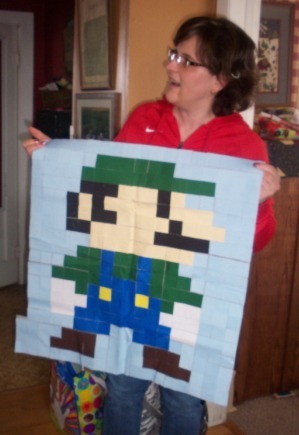 More amazing than Jody’s work is that she has committed to making THREE of these quilts….one for each of her boys. Now that’s dedication!! 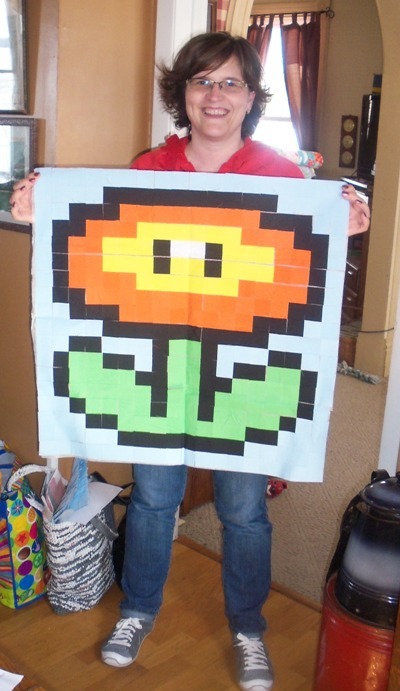 This entry was posted in Quilting, Sewing Projects on March 23, 2013 by Jo. 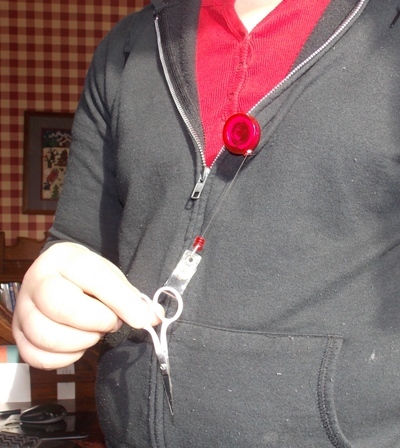 A long arm quilter I know had a cute little pin with a retractable scissor that I always wanted. Hers had a little quilting emblem on the pin part. I lifted the snap and added my little sewing scissor. I hook the badgge on my clothes and now I always have a scissor handy. It is especially wonderful when I am working on the long arm. There is always a scissor with me to clip threads. I wish I had done this YEARS ago. These would make great little gifts for you quilting buddies. 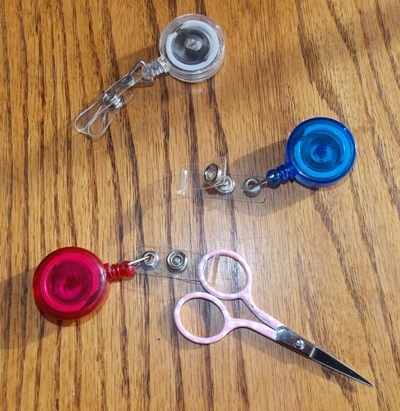 The scissor was only $3.95 and the badge holders can be found for about a dollar each. 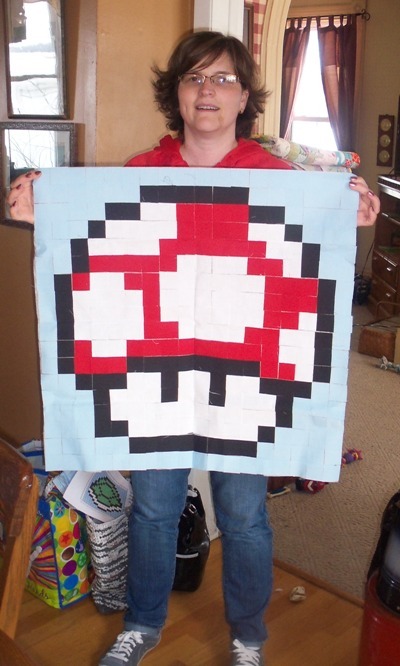 This entry was posted in Quilting, Repurpopse, Sewing Projects, Thrifty Ideas, Tutorials on January 19, 2013 by Jo.